The Wayfinders: Why Ancient Wisdom Matters in the Modern World. Wade Davis. Toronto, ON: House of Anansi Press, 2009. 262pp. In a time when the topic of climate change continues to make headlines while remaining a hotly debated subject (Nguyen 2009), Wade Davis has presented a refreshingly new way for the western world to address the problem – by turning to indigenous cultures that have maintained unique means of interacting with and preserving the environment around them. 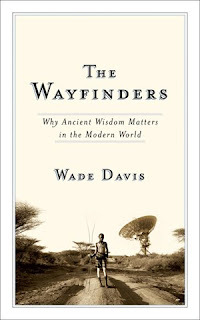 The Wayfinders is the most recent book from Davis, an anthropologist and ethnobotanist who trained under the famed ethnobotanist Richard Evans Schultes at Harvard. Davis left the world of academia but continued with his anthropological research, and he has produced a number of best-selling books for a more popular audience. He is currently Explorer-in-Residence at the National Geographic Society, where he continues to research, write, photograph, and make films. Indigenous languages are treasures of vast traditional knowledge concerning ecological systems and processes and how to protect and use some of the most vulnerable and biologically diverse ecosystems in the world. It is no coincidence that the areas where indigenous peoples live are the areas that contain the greatest biological diversity. In fact, biological, linguistic and cultural diversity are inseparable and mutually reinforcing, so when an indigenous language is lost, so too is the traditional knowledge for how to maintain aspects of the world’s biological diversity. The protection of indigenous languages is therefore not only a cultural and moral imperative, but an important aspect of global efforts to address biodiversity loss, climate change and other environmental challenges. This statement forms the basis of Davis’ argument, wherein he uses specific ethnographic examples to detail the complexity and depth of indigenous knowledge held by groups from such diverse regions as the rain forests of Malaysia, the mountains of Colombia, the deserts of Africa, and the islands of the South Pacific. For instance, one of his first ethnographic stories details the knowledge of a Hawaiian ‘wayfinder’, a traditional navigator of the Pacific. “The navigator must process an endless flow of data, intuitions, and insights derived from observation and the dynamic rhythms and interactions of wind, waves, clouds, stars, sun, moon, the flight of birds, a bed of kelp, the glow of phosphorescence on a shallow reef” (Davis 2009:60). This information is not recorded by the wayfinder, it is stored and recalled from memory, and is thus passed orally to the novice. The wayfinder is but one example of the complexity that indigenous knowledge can take, built from generations of interaction with particular environments. With each example of indigenous knowledge that Davis uses, he also shares a brief historical background to underscore the threat to survival that exists for each group and its associated knowledge, yet his argument could be stronger. He often notes the destructive nature of colonization, and he discusses the present day pressures faced by each group. These pressures are often a direct result of capitalist-based globalization that is expanding to the most remote corners of the globe, the very locations of many of Davis’ examples. This is perhaps where The Wayfinders could be strengthened. It is not until chapter 4 – halfway through the book – that Davis explicitly discusses the contradictory nature of the capitalist endeavor with what may be characterized as an indigenous worldview. Still, Davis falls short in what could be an exceptionally strong argument. He uses a discussion of a proposed Canadian mining project on traditionally indigenous-held lands to critique the capitalist worldview as linear and short sighted, and one that destroys for profit as opposed to preserves for future generations (114-119). He finishes this critique: “As long as there is a promise of revenue flows and employment, it merely requires permission to proceed. We take this as a given for it is the foundation of our system, the way commerce extracts value and profit in a resource-driven economy” (2009:119). While this is a fine argument against such capitalist projects, Davis could further strengthen his critique with a more fully Marxist discussion of how such projects might affect the indigenous people involved. Will they be brought into the exploitative system of wage-labor? Will their living conditions and health deteriorate? Will they be forcefully assimilated into the capitalist culture, yet remain a marginalized population therein? Davis critiques these types of capitalist ventures, and explains how they are ultimately harmful to the environment and contradictory to an indigenous worldview, but he falls short in conveying to the reader the all-too-often negative effects that result when a population is forced to transition to the capitalist economy. Throughout the second half of the book, it is clear that Davis sees the effects of a capitalist society on indigenous groups as consistently negative or harmful, and it could be argued that his is a Marxist point of view. Yet he fails to fully detail the form that these negative effects often take. For instance, in a section discussing the coca plant and traditional Andean groups in Peru, he touches on distinctly Marxist points: “The real issues of land distribution, economic exploitation, and the persistence of debt peonage challenged the foundations of their own class structure, so they [the Peruvian middle and upper classes] settled on coca as the culprit” (2009:125). He fails, however, to discuss these issues in further depth, and instead the text moves on to detail the history of coca use and its nutritional benefits. Ethnocide, the destruction of a people’s way of life, is in many quarters sanctioned and endorsed as appropriate development policy. Modernity provides the rationale for disenfranchisement, with the real goal too often being the extraction of natural resources on an industrial scale from territories occupied for generations by indigenous peoples whose ongoing presence on the land proves to be an inconvenience. This makes for a compelling argument; however there is little mention of what disenfranchisement means for the people who experience it. Here Davis is taking a distinctly political-economic stance in his analysis (Roseberry 1988); however he only glosses over what this means for the indigenous people themselves, besides a loss of their culture and cultural knowledge. While this is a critical point that Davis is making, it may leave his audience disconnected from the resulting experience of the very people he is discussing, which could be just as crucial a point. In the end, Davis argues that increasingly intense climate change events are the critical reason why the western world needs to consider indigenous knowledge as an important resource for humanity and for its insights into an alternative approach to living on the planet. Throughout the book, indigenous peoples’ relationship to the environment around them is detailed as drastically different from how most in the west view the environment. Davis shows that a deep understanding of the natural world in its minute details is often crucial to the well being and success of indigenous groups around the world. The Wayfinders is an engrossing read, full of ethnographic experience, and accessible to a wide audience, and it ties two vital issues of the day together. This is perhaps the greatest strength of the book – the under-discussed issues of language, knowledge, and cultural loss is directly implicated in the headline-grabbing issue of climate change. If this book is as widely read as some of his others, Davis may succeed in bringing wide attention to the importance of preserving the alternative systems of being that still exist around the globe. 2009 Rising seas could be worse than expected, scientific group says during stop in Tampa. St Petersburg Times. October 22. Electronic Document, http://www.tampabay.com/news/environment/water/rising-seas-could-be-worse-than- expected-scientific-group-says-during-stop/1046077. Accessed October 22, 2009. 2008 Report of the international expert group meeting on indigenous languages. Permanent Forum on Indigenous Issues. Seventh Session. New York. 20pp. This just helped me pass a test.